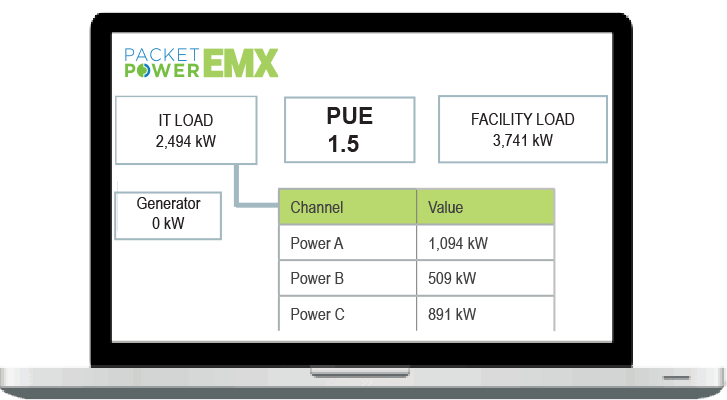 You may be required to measure and track your facilities' Power Usage Effectiveness (PUE) like U.S. government data centers under EO 13693. You may want to understand the impacts of energy efficiency initiatives you've deployed. Or, you may want to track your facilities' PUE performance across time. Monitor only the points you need to calculate PUE. Packet Power scales to your needs. And our wireless monitors cost less to buy, install and maintain than other metering solutions. Plug-and-play system reduces the need for expensive IT resources. Split core current sensors enable easy installation, often without disrupting power. Wireless meters eliminate the need for data communications wiring. And Packet Power's self-configuring network automatically configures and manages itself. Packet Power’s monitoring devices work with hardware from any vendor and can easily support devices such as SANs, switches and mainframes that often can’t be monitored with smart power strips. Our hardware feeds data to any monitoring application that supports SNMP or Modbus, and our software can accept data in those formats from any vendor’s hardware. Get your first PUE report immediately after installation. U.S. federal government data centers must have energy meters installed by fiscal year 2018 and meet the specified PUE benchmark. Packet Power published a white paper explaining the implications of EO 13693 for federal data center managers along with practical guidance for evaluating monitoring solutions.